Firestone is giving you a chance to race Indy 500 Champion, Mario Andretti and you'll be entered to win a trip to the Indianapolis 500 and get to meet Mario Andretti! Other prizes include autographed merchandise & more! Enter daily on Twitter or their website by sharing videos of yourself competing in challenges like the Orange Peel 500 and Fitted Sheet 500. And entries will not be judged. Grand Prize: There is one (1) Grand Prize available to be won. 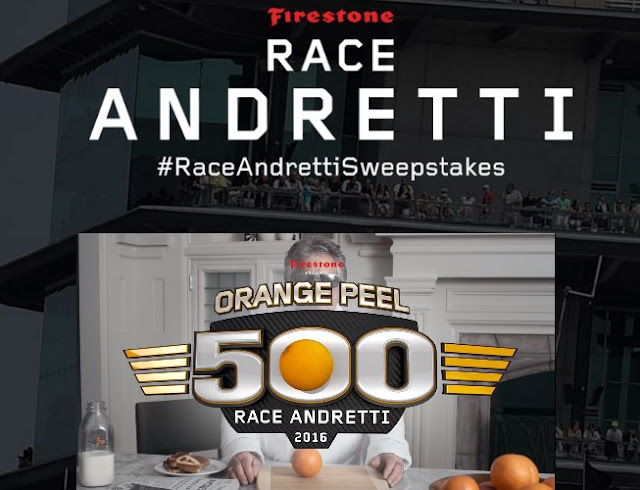 Grand Prize is a trip for winner and one (1) guest to the 2016 Indy500 Race in Indianapolis, Indiana from 5/27-5/30/16. Grand Prize trip includes 4-nights’ double-occupancy standard hotel accommodations at a location at or near Indianapolis to be determined by Sponsor in its sole discretion, round-trip coach air travel for two (2), from a major airport nearest winner’s residence, as determined by the Sponsor, ground transportation to/from airport/hotel, ground transportation to/from Grand Prize events/hotel, attendance for winner and guest to the VIP Drivers’ Dinner on 5/27/16 [additional restrictions apply; excludes alcohol], admission for winner and guest to the Firestone Legend’s Day Concert on 5/28/16, and Indy500 Race and Firestone’s VIP Chalet access and the chance to meet Mario Andretti for winner and guest on 5/29/16. Approximate Retail Value (“ARV”) of Grand Prize: $7,700. Bonus Challenge Prize: There is one (1) Bonus Challenge Prize. This Prize consists of One (1) $500 Firestone Complete Auto Care Gift Card, One (1) hat autographed by Mario Andretti and One (1) Firestone Indy 500 100th Running milk jug autographed by the winning race car driver of the 100th Running of the Indy 500 Race. ARV of Bonus Challenge Prize: $590.